A new face of sanitation now sits on Spring Street in Soho. DDC Commissioner Peña-Mora joined Department of Sanitation Commissioner Kathryn Garcia and Project Principal Architect Paul Bauer of Dattner Architects today to celebrate the official opening of the new Manhattan 1, 2, and 5 Garage Building. The 425,000-square-foot facility houses three district garages from which local Manhattan Community Board districts 1, 2, and 5 will receive garbage collection, street cleaning, and snow removal services. The structure accommodates over 150 Sanitation vehicles and includes facilities for DSNY personnel. This LEED Gold-certified structure, designed by Dattner Architects, boasts sustainable features including a glazed curtain wall façade and 2,600 custom perforated metal fins that reduce solar heat gain and glare while filtering natural light into the space. 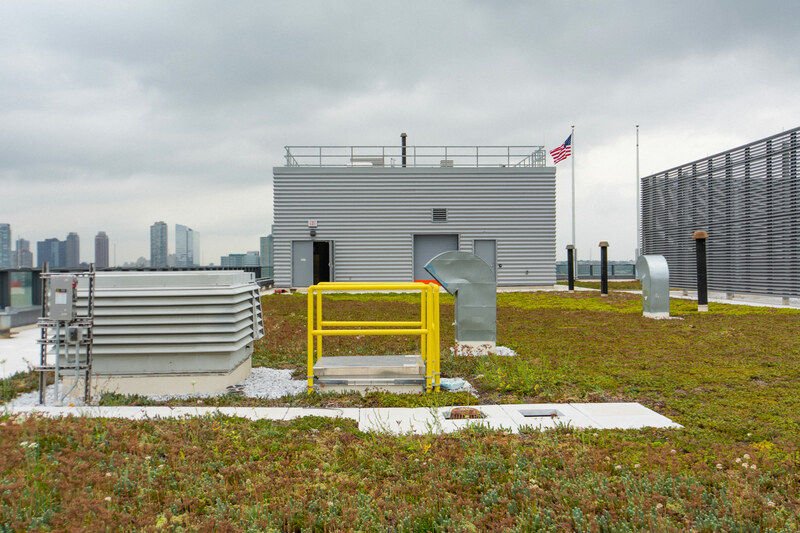 A 1.5-acre green roof is home to 25 distinct drought-resistant plant species. Harvested rainwater collected from the roof is used as graywater in the building and for truck washing. The building also operates on municipal steam, meaning no fuels burn to heat the structure. In addition to these energy-saving qualities, one stairwell is located next to the elevator banks on the southwest side of the building, showcasing views of the Hudson River and encouraging employees to take a more scenic and active route. “Manhattan 1 ,2, and 5 is a benchmark project for the City’s Active Design program which uses design to promote health and wellness of those who work here,” said Sanitation Commissioner Garcia. The Spring Street Salt Shed, a 70-foot tall facility that sits next to the M125 Garage, stores 5,000 tons of rock salt that is distributed throughout the city’s roads during inclement winter weather. A light color roof paver was chosen for the building to help reduce the heat island effect. The shed’s solid, crystalline surface complements the scrim-like façade of the garage. The Department of Sanitation operates 59 district garages and manages of fleet of more than 2,000 rear-loading collection trucks citywide. The Department clears litter, snow and ice from approximately 6,500 miles of City streets.